The pivoting deck combined with the flail blade ensures easy maneuvering and increased cutting performance for even the toughest jobs. 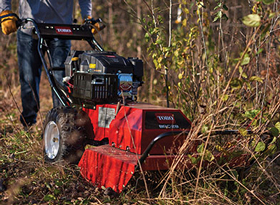 Standard electric start, larger fuel tank capacity and the 28 inch cutting deck increases operator productivity. 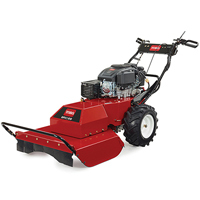 Easily maneuver this powerful machine in both forward and reverse with the one-hand control feature. A high-strength steel deck, 1 3/8 inch spindle shaft and larger diameter pulleys optimize the longevity of the machine. Deck Material: 50 ksi high strength steel pivoting +/- 10 degrees with spring return.